It time to acknowledge the 18th Annual Edgefield County Chamber of Commerce’s Citizen of the Year. If you know someone who deserves this award (good leadership or community service role, volunteer work, etc) please fill out an application form (call the Chamber office for nomination form) and return it to the Chamber office by Monday, August 26th. The Citizen must be a resident of Edgefield County. 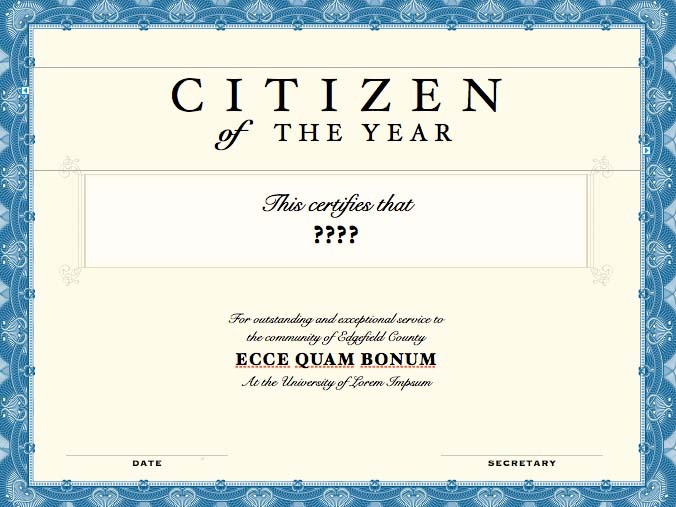 Also, why do you consider the nominee an outstanding candidate for Edgefield County Citizen of the Year? Additional Comments? Other information and materials in support of this candidate? Past winners of the award include: Watson Rhodes, Dixie Rucker, John Timmerman, Tim Campbell, Jackie Boatwright, Bettis Rainsford, Ken Durham, Anne Dukes, Mr. & Mrs. Weston Brazell, Rev. Kevin Cooley, Lynn Rearden, Helen Carpenter, Andy Livingston, Jimmy Painter, Dr. Wiley E. “Buddy” Turner, Anna Timmerman and last year’s winner Brad Covar. As you can see we have a wide range of community involvement in our past winners. Acknowledgement of our Citizen of the Year and Teachers of the Year, Support Staff of the Year, and our District Teacher of the Year, as well as District Support Staff of the Year. Celebration of Success 2013 will be held, Tuesday evening, September 3rd, beginning at 6:30 PM in the Strom Thurmond High School cafeteria. Entertainment at this year’s event will be Mike Frost Jazz. Tickets for this year’s event will be $25.00 per person, and they can be purchased at the Edgefield County Chamber of Commerce (275-0010), the Edgefield County School District office (275-4601), or from any school principal. Deadline for ticket sales is Monday, August 26th. One Response to "Citizen of the Year Award"